Silicon Valley is known for bold ideas, and the expansion of San Jose Mineta International Airport reflects the area's reputation for innovation and technology. From the captivating curves of its perforated metal facade, meant to suggest fiber-optic cable, to the air-conditioned chairs in its gate waiting areas, the $1.8 billion upgrade program - one of the largest design-build contracts ever - has garnered kudos for its forward-thinking and green solutions. Nowhere is this success more evident than in the airport's Terminal B, slated for LEED Silver. Opened late in June 2010, its six new gates are served by an efficient security checkpoint, automated baggage service, and eye-catching shops and restaurants in a soaring concourse with ample skylights. "The interior is based on the idea of an unraveling cable, organized in a way based on a Spanish shopping street, or paseo, and colored with earth tones found in the San Jose area," says Mark Rothman, AIA, DBIA, LEED AP, project manager and San Jose director for Fentress Architects, which was led by Hensel-Phelps Construction on the airport expansion. Among the natural finishes envisaged by airport officials was the warmth of natural wood. "The airport instructed us not to use any synthetic wood finishes," says Rothman. "They had used Douglas fir veneer on the concourse side, a gesture always meant to designate an area of importance." To meet this need - as well as fire marshall prohibitions against using solid wood finishes - Fentress and Hensel-Phelps selected a suspended metal ceiling system by Hunter Douglas Contract: A 5/8-inch-deep Luxalon Box system with wood veneer on universal carrier suspension mounts for design flexibility. 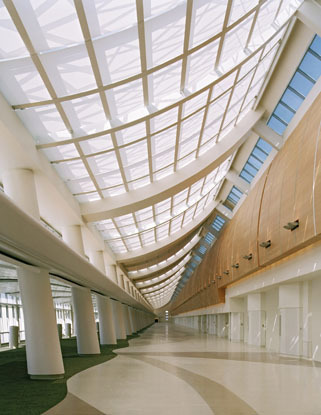 The wood elements follow curved and sloped surfaces, mainly along the arched vertical walls that extend along the length of Terminal B. Appearing as maple slats, the metal system delineates aerodynamic and organic shapes that echo the exterior's perforated screen and add visual interest to the expansive, daylighted interiors. While the precise reveals of the veneer-clad box profiles offer provisions for acoustical control and even HVAC and lighting, the design did not need to rely on the wood areas to dampen interior noise. The waiting areas with their lower ceiling height reflect the building's roofline, with lighting from a clerestory window. "The airport wanted this area to be relaxing and inviting, so there it steps down in scale, and the floor transitions from terrazzo to carpet," says Rothman. Most important, the design-build team needed interior systems that could contribute points toward LEED certification. Both the pan ceiling systems and wood-slat products contained at least 70% and up to 95% recycled content, with GREENGUARD Children and SchoolsSM certification, a benefit for overall indoor environmental quality (IEQ). In the end, the ceiling specifications became closely linked to the architectural expression, like the dramatic curving screen of perforated metal panels that greet travelers. While the metal screen wall was not engineered as a solar control system, the concourse provides a comfortable and inspiring space, with sunlight levels muted by a system of large Skylight Tension Shades. An integrated cleaning system also eases the airport's day-to-day operations. Airport officials have been pleased with the improved operations and positive media attention garnered by the newly inaugurated facilities, attributing their success largely to the integrated project delivery. "Just before we hired Fentress Architects and Hensel Phelps, we were $150 million over budget," says Bill Sherry, director of aviation for San Jose airport. "Now we're more than $140 million under budget and celebrating the opening of the modernization one year earlier than if we'd done it as design-bid-build."